Stiff man syndrome (SMS) (also known as Moersch-Woltman Condition; first described by Moersch and Woltman at the Mayo Clinic in 1956) is a rare neurologic disorder of unknown etiology characterized by progressive rigidity, stiffness, primarily of the axial musculature, and involuntary painful spasms, usually involving the lower back and legs and resulting in postural deformities (clinical picture of stiff-legged gait with exaggerated lumbar hyperlordosis). - stiff limb syndrome → characterized by focal stiffness typically affecting distal legs and feet. This disease is very rare, possibly affecting as few as 1 in 1,000,000 people. It affects twice as many women as men and it is frequently associated with other autoimmune diseases such as diabetes (in fact a GABAergic system and GAD, an enzyme probably involved in the pathogenesis of SMS, are also present in the ß-cells of pancreatic islets), thyroiditis, vitiligo and pernicius anemia (leading scientists to postulate an autoimmune desease as the origine of the syndrome). Age of onset is usually 30–50 years of age, but can occur in children aged 3 years old and younger. At this age it is known as Stiff Baby Syndrome. Psychic symptons → Depression and anxiety are often noted in SMS patients; this may be a result of discomfort due to stiffness and deterioration in the quality of life, rather than underlying neurochemical abnormalities; in fact MRI detection of GABA in the brain have demonstrated reduced levels of this hormone in stiff-person syndrome. In Stiff-limb syndrome, a variant of the original SMS, symptoms affect focally one or more limbs, occurring predominantly in distal limb muscles rather than axial muscles. However, when severe spasms arise, motor symptoms can be also seen in the trunk, upper extremities and face. Increased distal limb stiffness in ankles and feet leads to a feet posture (feet being) in constant plantar flexion, and this, in turn, affects posture during gait and increases fall risks for the patient. Individuals with stiff person syndrome tend to present in 3 different stages: early, late and end stage. -	In the early stages, during the initial assessment, there are few objective findings indicating SMS. Beginning insidiously in the axial muscles, patients present with an exaggerated upright posture and have stiffness and pain in the whole back. Sleep disturbances are also common (due to muscle spasms). -	In the late stages, proximal limb muscle become involved and the patients tend to move slower as fast movements will cause the severe spasms. Spasms occur in response to environmental stimuli such as voluntary or passive movements, and unexpected somatosensory or auditory stimulation (emotions such as anger have been shown to have a link to causing the spasms; changes in emotion or stress can trigger spasms as well). Lumbar lordosis becomes more evident. Patient’s quality of life decreasing can be the reason of a comorbid depression. The suspect is given by clinical signs. A definitive diagnosis can be made with a blood test that measures the level of glutamic acid decarboxylase (GAD) antibodies in the blood; patients have high anti-GAD titres (usually over 20 nmol/l), measured in the serum. These antibodies are also found in the cerebrospinal fluid of stiff-person syndrome patients. Furthermore, regarding instrumental analysis, investigations reveal a characteristic abnormality on EMG recordings with continuous motor unit activity of the paraspinal axial muscles. The following differential diagnoses should also be considered when suspecting stiff man syndrome. Since many patients have circulating antibodies to the enzyme glutamic acid decarboxylase (GAD), an autoimmune cause of the disease has been postulated (but the exact cause of classic SMS reamins unknown). Therefore clinico-pharmacological evidences suggest an impairment of inhibitory GABAergic pathways; normally, GAD is the rate limiting enzyme in the biosyntheis of GABA in the CNS, catalyzing the decarboxylation of glutamate to GABA and CO2. However, autoimmunity cannot be the sole cause; in fact most Type I diabetics possess anti-GAD antibodies, though the frequency of SPS among Type I diabetics is just 1 in 10,000. Among patients diagnosed with SMS, approximately just 60% of them have anti-GAD antibodies present, while 40% do not; this means that a little more than half of patients can explain their syndrome with an autoimmune reason and find a diagnosis using a laboratory analysis (very high anti-GAD titres, usually over 20 nmol/l). On the cotrary, the others rely on clinical testing for diagnosis. In addition to the presence of these antibodies against some GAD protein epitopes, mutations of GLRA1 (glycine receptor) have also been identified as responsible for some cases of stiff person syndrome. Another rare, important but not well known association is between SPS and paraneaplastic syndromes, connected with breast cancer and Hodkin’s lymphoma. 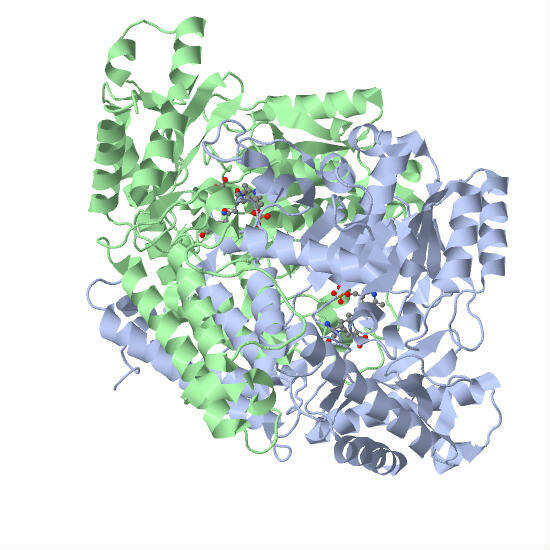 Glutamate decarboxylase or glutamic acid decarboxylase (GAD) is an enzyme that catalyzes the decarboxylation of glutamate to GABA and CO2. GAD uses PLP as a cofactor. GAD exists in two isoforms encoded by two different genes – GAD1 and GAD2. These isoforms are GAD67 and GAD65 with molecular weights of 67 and 65 kDa, respectively. Genes GAD1 and GAD2 are expressed in the brain where GABA is used as a neurotransmitter; GAD2 is also expressed in the pancreas. Furthermore, there are at least two more forms (GAD25 and GAD44), coded by alternative transcripts of GAD1; these forms are described in the developing brain. GAD65 and GAD67 synthesize GABA at different locations in the cell, at different developmental times, and for functionally different purposes. -	GAD67 synthesizes GABA for neuron activity unrelated to neurotransmission, such as synaptogenesis and protection from neural injury. This function requires widespread, ubiquitous presence of GABA. -	GAD65, however, synthesizes GABA for neurotransmission,3 and therefore is only necessary at nerve terminals and synapses. In order to aid in neurotransmission, GAD65 forms a complex with Heat Shock Cognate 70 (HSC70), cysteine string protein (CSP) and Vesicular GABA transporter VGAT, which, as a complex, helps package GABA into vesicles for release during neurotransmission. -	GAD65 is not transcribed until later in life. This developmental difference in GAD67 and GAD65 reflects the functional properties of each isoform; GAD67 is needed throughout development for normal cellular functioning, while GAD65 is not needed until slightly later in development when synaptic inhibition is more prevalent. GAD67 and GAD65 are both regulated via phosphorylation, but the regulation of these isoforms differs; GAD65 is activated by phosphorylation while GAD67 is inhibited by phosphorylation. -	GAD65 is phosphorylated, and therefore regulated by, protein kinase C (PKC). Both GAD67 and GAD65 are also regulated post-translationally by Pyridoxal 5’-phosphate (PLP); GAD is activated when bound to PLP and inactive when not bound to PLP. -	whereas GAD65 binds PLP when GABA is needed for neurotransmission. -	GAD65 must only be activated when GABA neurotransmission occurs, and is therefore regulated according to the synaptic environment. It is mostly palliative, using muscle relaxants which potentiate GABA action, such as benodiazepines (but treatments lose their effectiveness as the illness progresses); people with SMS respond to high doses of diazepam and several anti-convulsants, gabapentin and tiagabine. Monoclonal antibody rituximab has produced long-lasting remissions but a study using this drug, conducted by NINDS (The National Institute of Neurological Disorders and Stroke) proved ineffective in treating individuals with the disorder. Current research is focused on understanding the cause of the disease and the role of the anti-GAD antibodies.